If I asked them, most readers would probably guess that my favorite fall weekend activity involves touring haunted houses or camping in dark, creepy forests where shadows stretch long and ghosts seem to lurk behind every turn. You might guess that too. But you’d be wrong. 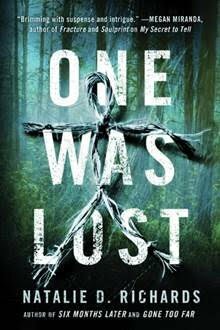 ONE WAS LOST is pretty much my worst nightmare come to life. First off, I’m not much of a camper. I’ve done my share—woken up in cold, damp tents with daddy long legs crawling up the walls while I quietly longed for death in my musty sleeping bag. Then I grew older and realized that unless I’m intent on long distance hiking in Wyoming or Alaska, I can probably find a route that will end with a short drive to a Springhill Suites. My version of camping is a hotel without WiFi. So what about haunted things? You can keep them. Places or boxes or forests that might actually have supernatural what-nots roaming about waiting to spook me? Absolutely not. I like all the creepy things tucked neatly into my books and television shows thank you very much. My perfect fall weekend isn’t what you might guess. Because I’d spend it at our local pumpkin patch. Oh, I know. What even is that? Big bad horror writer eating homemade kettle corn and picking out pumpkins while a bluegrass band plays on a stage decorated with gourds. It’s true. I buy too many pumpkins and spend hours playing in the corn maze and bumping along on hay rides and posing for corny pictures on giant tractors and I. Love. Every. Ridiculous. Minute. Of. It. But that’s the thing about being a horror writer. We aren’t what you think of. I’m at the pumpkin patch with a million other moms. My children are there too, three blonde-haired blue eyed kiddos who rave about my homemade caramel apples and pumpkin muffins. I look like any other nice, Midwestern lady, and I am. And I’m also something else. Inevitably the talk will turn to careers. “So, what do you do for a living?” they’ll ask. Often they’ll tell me how very interesting that sounds. Sometimes they’ll ask for a bookmark and every once in a while they’ll ask a lot of great questions. But almost every single time there’s one response I can count on. That’s the thing about fear. You never know when you’re going to get scared, or who’s going to scare you. So, the next time you’re at a pumpkin patch—and you should be, because it’s awesome—just remember that perfectly friendly looking woman you see by the corn maze might just be measuring you up. After all, every horror book needs a few dead bodies. Someone is stalking them through the woods. Someone who drugged them, stole their supplies, and wrote on their skin. Is it a judgement? A warning? If Sera doesn’t uncover the truth, it’s only a matter of time before the hunter finds her. After years as a professional paper-pusher, NATALIE D. RICHARDS decided to trade in reality for a life writing YA fiction. She lives in Ohio (Go Bucks!) with her husband, three children, and a ridiculously furry dog named Yeti. This is her fourth novel. Visit her on Twitter @natdrichards or at nataliedrichards.com.